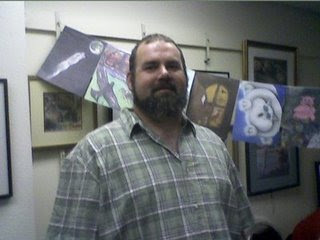 Children’s writer/illustrator David Cronk (shown in photo, with some of his illustrations in the background) was born in Laramie, grew up in Cheyenne and now lives in Denver. He visited the Cheyenne Family YMCA today to talk to kids from 3-10 years old about his new book, “Critter Junction.” In the evening, before a crowd of adults at the YMCA, he talked about the ins and outs of publishing his first book. For more info about David and his book, write to Mountainheart Publications, PO Box 630376, Littleton, CO 80163.